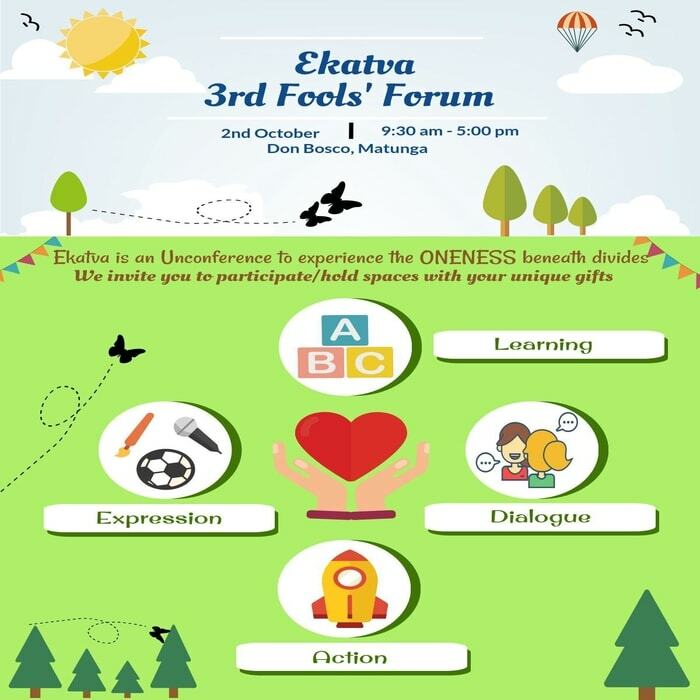 We invite you to celebrate and partner with us for Ekatva: The 3rd Fools Forum! In these times of divides, (of gender, religion, caste, class, profession orientation and even town-suburbs!) we invite you to experience the oneness beneath these. To partner, we invite you to “sense” into the spirit of the event – and offer anything creative and celebratory? From workshops to art corners, and games to poetry reading, all for Ekatva. ?? This is co-held, co-designed space. Hi- this was an event where people got together to learn and share from each other- ANYTHING. The idea was for a group of people to get together and talk about what matters in society and how one could change it- the goal was to build a community of people who were ready to do something!